Twenty-five years after coming to studynot far away at York University and publishing her bestseller, the Wild Swan was back again, standing in the pulpit of Beverley Minster to promote the same book in the Beverley Literature Festival. 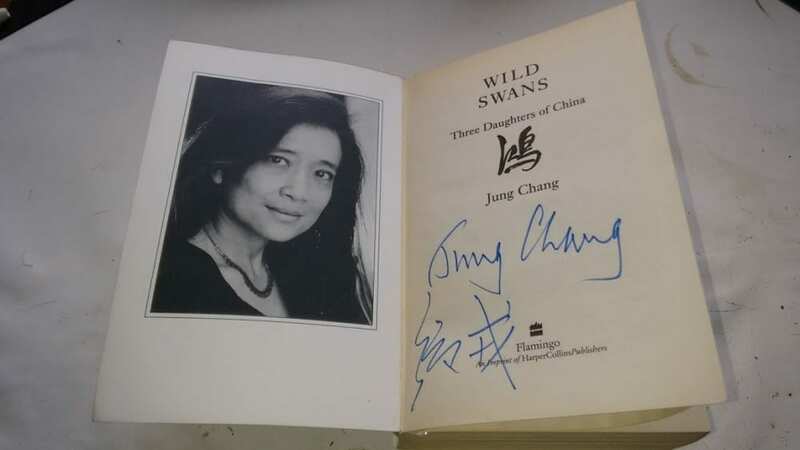 A quarter of a century has passed and Jung Chang is still living her history. She spoke clearly but gently, without an accent, her eyes sweeping over a large attentive audience. Here, in a provincial English market town, her story still resonates. The theme was ‘love’, and she retold the same story she wrote in her 1992 book of three wild swans – swan is part of her surname. It could be seen as a feminist story of three women who haunt her still. Her grandmother was a concubine of a warlord. Her mother, in tears, bound her feet, saying she would never find a man to marry if she didn’t. Tiny, childlike feet were said to be so attractive to men of consequence, whose wives do not have to work. Her female servants with unbound feet would supply everything she needed. She would only have to look beautiful and comply. Children were important, but she could not look after them. Then her mother, whose feet were unbound because times had changed and, anyway, the custom was made illegal by a law passed early in the twentieth century. Instead her parents, passionate communists, were caught up in the Maoist Cultural Revolution, convinced that they could transform China to benefit everyone. Through them she could observe Chairman Mao. Jung Chang was reliving for us a totally alien world, and all the more fascinating for that. I remember reading the thick volume soon after it was published. It inspired me to visit China soon afterwards. We were only allowed to travel in a group organised by the Government’s official agency with their chosen guides. One travelled with us throughout, using local guides to help out. Any other contact with Chinese people was not permitted. Only once did we break away when we were allowed on shore during a boat journey down the Yangzi River. It was not a large boat. There was one other group from America on board, as zealously guarded as ours. We saw the building of a huge dam. On both sides of the river narrow, perilous paths had been cut in the sheer cliffs for the men who used to pull the boats up river before steam engines were used. We stopped at a small town and, at last, were allowed to explore on our own. Some of our group went to look at a school and were invited inside to observe what seemed to be learning by rote. Others went to the market and swore they saw dog meat for sale. Two of us wandered around to look at buildings and tried to speak to the local people. They tended to turn away and avoid having any conversation. Language was a barrier, though I tried simple sentences in all the languages I know. Only once did our guide break away from the official information she was primed to give us. I asked her about her experiences of the Cultural Revolution. She choked back tears, saying she had been taken to see her mother and can never forget her coming towards her over the snow, chained, leaving patches of blood behind her. It’s an image I have never forgotten. Her mother’s crime? It was to have a sister who had fled to work in Indonesia and was sending money back. Times have changed, Jung Chang told us, but she didn’t say how or whether they for the better. She was allowed back to see her mother, but her books cannot be published and sold in the Chinese People’s Republic. Can Jung Chang ever escape the round of living and reliving her history? Or does she not want to? Yes, Wild Swans was an extraordinary book and it must have been so interesting to meet its author, Judy Chang. Was so interested to read your account and of your journey and experiences in China – that visit inspired by the book…..
Good to hear from you. Sorry about my belated comment. We’ll be in London this coming Monday and Tuesday – any chance we could meet? I look at my emails regularly so that may be a better way to communicate. Moving! I visited China twice, the first time as a day trip from Hong Kong, when we watched brightly dressed well cared for nursery school children exercising.waited for a dozy panda to emerge, admired stone warriors and wandered round historic sites and streets which had a character and charm which the skyscrapers of Hong Kong lacked. I thought of my maternal grandmother growing up in the European enclave, her sister who was a governess to the children of a wealthy Chinese merchant until the Second World War and internment, and the children of my great grandfather’s Chinese concubine, who were sent back to England to be brought up by my great grandfather’s mother in Liverpool. The boy became a clerk and the girl a dressmaker. There was an atmosphere in ‘Canton’ which was reminiscent of those vibrant merchant times. My second visit was with a group from Adventure Travel and we followed the conventional tourist trail, admiring historic sites and scenery. We paid a visit to a Hutong in Beijing and met and were invited into the home of a Chinese family. We were told that some of these Hutongs might be pulled down to make room for the forthcoming Olympic Games to be held in Beijing.